Have you ever walked through the grocery store and felt frustrated with how they organize the items? All the breakfast cereal is together in one place, but if you want waffles and syrup you have to travel to a whole different section of the store? You can buy pasta and tomatoes in the same isle, but if you’d like to add olives to your sauce you have to go to another isle altogether? Who comes up with these plans? Take a look at your kitchen cabinets and your pantry if you have one. How are your items stored together? Are they stored in a way that mimics how you purchased them at the store? Do you store them so cans go in one area and boxes go in another? Try a different approach. Set aside a block of time and clear everything off your selves and/or out of your cabinets. Now really take a look at what you have. Make groups of like items. I like to group by type: breakfast, snacks, baking, grains, oils, etc. You get the idea. Now think about how often you use the items and where you store them. 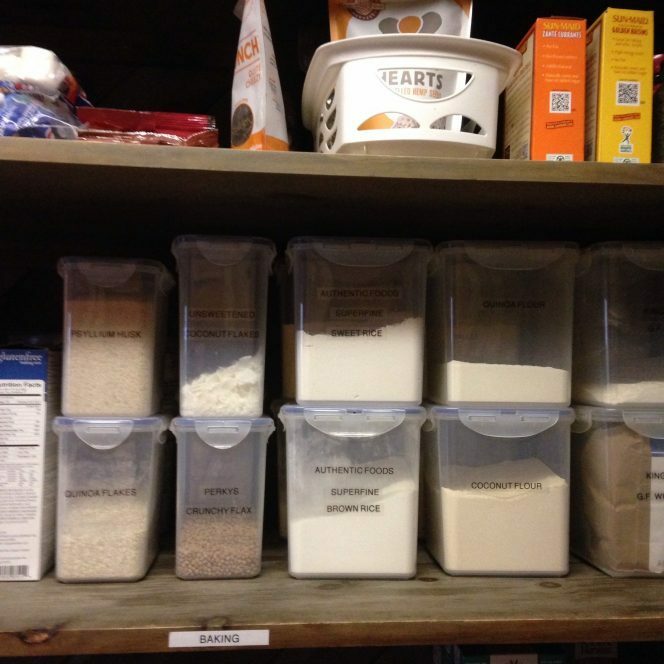 If you are lucky enough to have a pantry, think about using that to store items you don’t need to access very often. If you have small children, think about creating an area at their level where they can get their own snacks (with your permission). Make your space work for you, not against you. When I put the kids’ stuff at their level, it not only made it easier for me, but they gained confidence in their independence. Good stuff, Beth!